Composer and arranger Paul Murtha, a native of Johnstown, visited Altoona Area High School’s Advanced Jazz Ensemble for a workshop with students on Monday afternoon. Murtha recently was commissioned by Altoona’s music department to write two arrangements: “Everyday I Have the Blues” and “All Right, OK, You Win,” according to Paula Foreman, the school district’s community relations director. 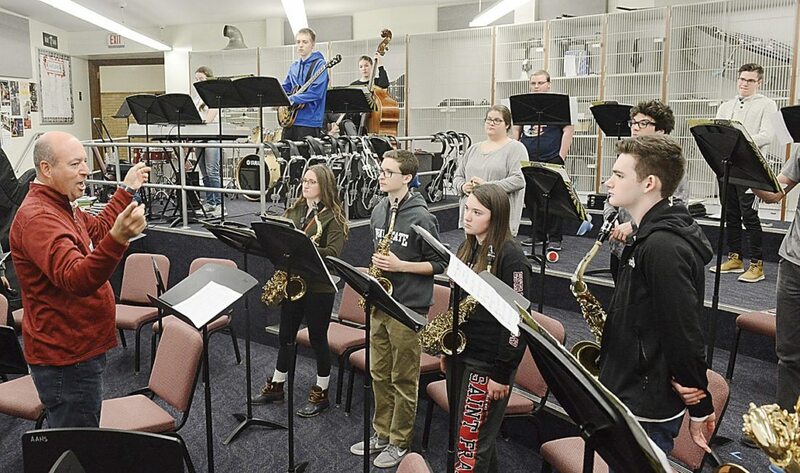 The Altoona Advanced Jazz Ensemble was one of two high schools selected to perform at the Pennsylvania Music Educators Association State Convention on April 20 at the Lancaster Convention Center. Murtha was commissioned to write two of the arrangements that will be performed at the convention. Victor Goines, a native of New Orleans, Louisiana, will perform with the Altoona Advanced Jazz Ensemble at the convention. Murtha earned a bachelor of science degree in music education from Duquesne University in Pittsburgh. He studied jazz arranging with John Wilson and orchestration with Joseph Wilcox Jenkins. He has written extensively for some of the top college and high school marching bands in the country. His work with the National Symphony Orchestra includes arrangements for artists such as Trace Adkins, Jordin Sparks, Gloria Estefan, Gladys Knight, Huey Lewis and the News, The Four Tops, The Beach Boys and The Blues Brothers. He has served as the Chief Arranger at the United States Military Academy Band at West Point, N.Y.